Children and adolescents can choose any type of moderate or higher intensity physical activity, such as brisk walking, playing tag, jumping rope, or swimming, as long as it is adds up to at least one hour a day. Children and adolescents who are just beginning to be physically active should start out slowly and gradually build to higher levels in order to prevent the risk of injury or feel defeated from unrealistic goals. It is important that children and adolescents are encouraged to be physically active by doing things that interest them. This will help them establish an active lifestyle early on. 1This physical activity recommendation is from the Dietary Guidelines for Americans 2005. As a parent, you have an important role in shaping your children�s physical activity attitudes and behaviors. Here are some tips to encourage your children to be more physically active. Set a positive example by leading an active lifestyle yourself, and make physical activity part of your family�s daily routine such as designating time for family walks or playing active games together. Provide opportunities for children to be active by playing with them. Give them active toys and equipment, and take them to places where they can be active. Offer positive reinforcement for the physical activities in which your child participates and encourage them as they express interest in new activities. Make physical activity fun. Fun activities can be anything the child enjoys, either structured or non-structured. They may range from team sports, individual sports, and/or recreational activities such as walking, running, skating, bicycling, swimming, playground activities, and free-time play. 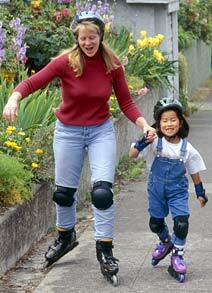 Ensure that the activity is age appropriate and, to ensure safety, provide protective equipment such as helmets, wrist pads, and knee pads. Find a convenient place to be active regularly. Limit the time your children watch television or play video games to no more than two hours per day. Instead, encourage your children to find fun activities to do with family members or on their own that simply involve more activity (walking, playing chase, dancing).